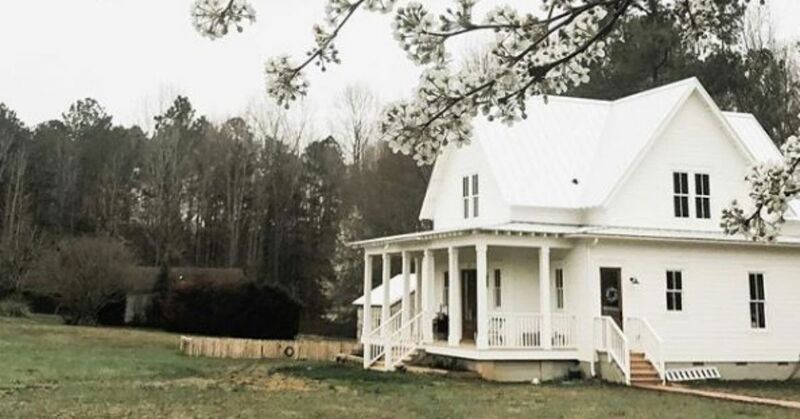 Autumn is a wife, mother and master decorator of her family's vintage farmhouse. Her self-described "farmhouse primitive" aesthetic offers a clean palette for the home, which is lovingly furnished with antique finds and clever DIYs. The home's exterior is painted a crisp white. Its roomy front porch adds to the Southern charm, as do blossoming trees and towering oaks. With panoramic windows and ample light, the interior is equally as stunning. Soapstone countertops offer welcome contrast to white cabinetry and shiplap siding in the kitchen. A roomy farmhouse sink sports a vintage silver faucet that complements the stainless steel range and fridge. Flat-weave throw rugs add style underfoot on hardwood flooring. Open shelving displays vintage crocks and earthenware. Beyond the kitchen, an eat-in dining area is surrounded by full-length windows. Vintage farmhouse table and chairs sit below a retro chandelier. White shiplap siding surrounds the fireplace and mantel in the living room. A sisal rug is flanked by two roomy sofas finished with white slip covers. Antique portraits and vintage sconces surround the hearth to complete the Old World vibe. White shiplap siding offers an airy palette for the bedroom. Layers of white linens top the antique bed, a favorite lounging space for the family's two labs. An antique iron bed is decorated with vintage touches in the girls' room. Here, floral hoops serve as artwork above the headboard. White linens are accented by subtle pink accents for a feminine touch. A vintage clawfoot tub provides a relaxing escape in the master bathroom, which is painted in a soft gray that contrasts beautifully with dark oak flooring. Outdoors, the back porch offers space for a large farmhouse table and café chairs near the pool. The girls' playhouse has a charming farmhouse look, too.